I just finished a tiring, but fun day! Today my wife and I went to Virginia Beach to go rock climbing, and then we went to Colonial Williamsburg in the evening to go have dinner and walk around with our dog. Rock climbing was extremely fun! 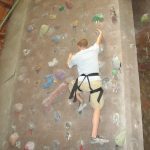 The last time I went rock climbing was before I started the P90X workout, and it went very bad! I only went up the wall a few times and I was dead tired. Today I went up the wall about 5 or 6 times and I felt great afterwards! I’d love to go rock climbing more often! Colonial Williamsburg was beautiful as ever and we enjoyed a nice dinner and walking around with our dog, Mackenzie. I love the historical atmosphere of Williamsburg. It did start getting a little bit chilly outside, but we still had a good time. We got home earlier than I thought, so I figured I’d go ahead and do P90X X Stretch. It felt really good to stretch out all of my muscles especially after going rock climbing earlier in the day. Well, tomorrow is the start of the final week of P90X! I’ve got Yoga X tomorrow, and I’m going to have to knock it out first thing in the morning since we’ll be heading back to Williamsburg to go to Busch Gardens. I’m excited to do Core Synergistics on Monday!